"Spanish War Horse. Spanish Mustangs. Spanish Horses. Zebra Dun." A variety of colors occurs in the herds, which needs to be maintained. Initial culling in favor of Spanish phenotype should be accomplished and a long term plan for population numbers and culling strategies should be formulated. This is one population that should be kept free of introductions from other herd management areas, as it is Spanish in type and therefore more unique than horses of most other BLM management areas." He later states: "The horses removed during the last few years from the Sulphur Herd Management Area are Spanish in type. The fact that the horses were so consistently Spanish type is evidence that these horses have a Spanish origin, "This evaluation therefore establishes the Sulphur horses as Spanish in appearance". .
Is there a difference between a Dun Factor Horse, a SMR Horse and a Sulphur Horse??? According to D. Philip Sponenberg, DVM, PhD, of Virginia-Maryland Regional College of Veterinary Medicine and Technical Coordinator, American Livestock Breeds Conservancy: "The three main tools for evaluating horses (for Spanish descent) are the history behind the individual horse, the appearance of the horse, and the blood-type of the horse." 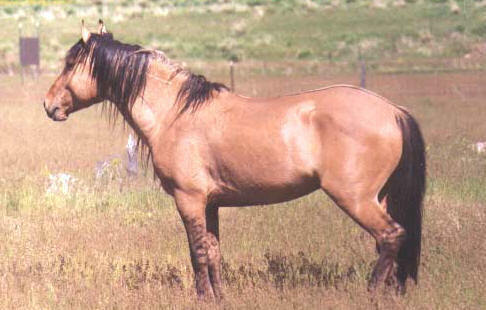 During August 1993, Dr. Sponenberg came to Utah and inspected thirty-four Sulphur horses that the BLM had adopted out to various individuals. His subsequent evaluation states: "The Sulphur Herd Management area horses that are present as adopted horses in the Salt Lake City area appear to be of Spanish phenotype. The (Sulphur) horses were reasonably uniform in phenotype, and most of the variation encountered could be explained by a Spanish origin of the population. That, coupled with the remoteness of the range and blood-typing studies, suggests that these horses are indeed Spanish. As such they are a unique genetic resource, and should be managed to perpetuate this uniqueness. Traditionally, horses were thought of as an exotic species that arrived on this continent for the first time with the Spanish in the 1500s. However, advances in molecular biology prove that the modern horse, Equus Caballus, actually evolved on this continent and migrated across the Bering Land Bridge. The horse disappeared on this continent between 11,000 and 13,000 years ago. When the Spanish brought horses back to North America, the horses were simply returning home.